1-CD Deluxe album with 72-page booklet, 28 tracks. Total playing time approx. 86 mns. Our quarter-century retrospective ends here. In country music, as in the broader recording industry, change had been profound. In 1945, the only commercial sound-carrier was the 78 RPM disc. By 1970, it had been ten years since the last 78s fell from the presses. They had been supplanted by LPs (1948), 45s (1949), 8-tracks (1962), and cassettes (1965). By 1970, rock, classical music, and jazz were usually bought on LP. Country and R&,B were still singles-driven, and most country albums still comprised one hit single and nine filler tracks. Twelve years had passed since stereo was standardized, and by 1970 most major manufacturers had discontinued monaural LPs. One of the record industry's prize abominations, Rechanneled Stereo, tried to make stereo out of mono (high and low frequencies were split and desynchronized by a fraction of a second to create the illusion of stereo). That’s one audio fad that has never come back. In 1945, recordings could only be made to acetate, but tape was widely adopted soon after its introduction in 1948. Tape was cheap and easy to store. Single-track tape quickly gave way to two, three, four, and then eight-track. By 1970, Ampex was making 16-track recorders, and Jack Clement installed Nashville's first in his studio that year. Edits and overdubs, almost impossible with acetate, were way too easy with multitrack. Wartime shellac rationing was phased out in 1945. With limited pressing capacity during the war, major labels cut back their rosters leaving only the most profitable acts. Most rural string bands and hillbilly brother duets, in fact most artists without a national profile in every genre, were jettisoned. Immediately after the war, the major label rebuilt their rosters and independent labels proliferated. Plenty of indies tried to crack the majors' stranglehold on country music. Capitol, launched in 1942, succeeded, as did Mercury, launched in '45, but the sustained success stories ended there. Monument, launched in 1958, did well for twenty years but eventually succumbed. Starday underwent several changes in ownership from 1953 onward, and was still around in 1970, newly merged with King Records. Other indies, like Sun, Fabor-Abbott, and 4-Star, saw their big acts poached by the majors, and found it hard to break the majors' iron grip on country airplay. 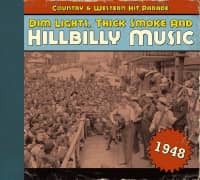 Country music, dubbed Hillbilly or Folk in 1945, was recorded nearly everywhere but Nashville. By 1970, Nashville had become country music's epicenter. As Willie Nelson said, Nashville was the store, and if you had something to sell you needed to go there. Even top west coast country artists, including Buck Owens and Merle Haggard, retained a Nashville presence. Almost inevitably, uniformity developed when nearly everyone was recording songs by the same songwriters in the same studios and with the same session guys. In 1945, you could hear a record and make an educated guess at where a singer came from, by 1970 that was pretty much impossible. But in 1970, you could still sit in the lobby of one of the big labels or music publishers on Nashville's fast-growing Music Row and demand to be heard. The bus station for the ride home was conveniently close. Robert Elfstrom's engrossing 1970 documentary, The Nashville Sound, followed one wannabilly, Herbie Howell, as he made the rounds, his self-belief undimmed by rejection. Many of the artists in this compilation made cameos in the movie, almost certainly without the months of tortured negotiation it would take to get one of today's country stars in a documentary. "Various - Country & Western Hit Parade"
The reviews are in and everyone from Australia to Los Angeles to London is raving about Bear Family’s definitive year-by-year country series. 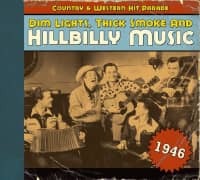 Starting in 1945, DIM LIGHTS, THICK SMOKE, AND HILLBILLY MUSIC (COUNTRY & WESTERN HIT PARADE) tells the real story of country music record-by-record. The hits are here, but so are groundbreaking records that went nowhere at the time. 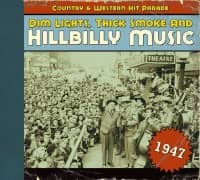 This is the true and uncensored history of country music. Everything you need to hear, year-by-year. Stars like Hank Williams, Bob Wills, Eddy Arnold, Ray Price, and Hank Snow are here, but so are beerhall legends like Eddie Noack and Sonny Burns, and roots music mavens like Charlie Feathers and the Stanley Brothers, as well as overlooked giants like Carl Belew and Floyd Tillman. You’ll also hear the incredible original versions of songs like Duelin’ Banjos, Release Me, Lonely Street, and many more! 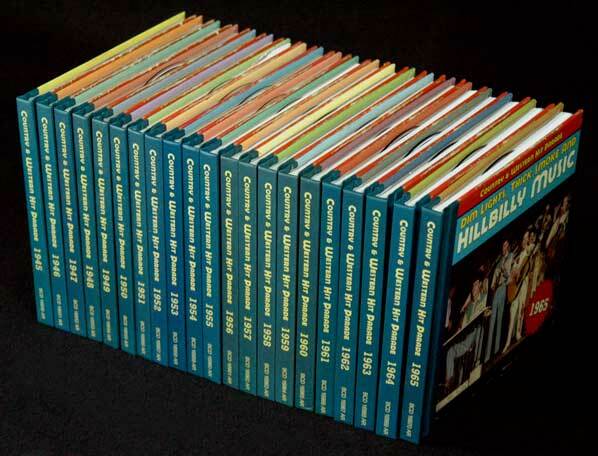 Every CD is full to the brim with great music, and they’re all individually packaged in hardcover 72-page books by Colin Escott that tell the story of every song as well as the broader music history of the time. Fabulous photos, original record labels, and period advertisements round out the packages. Bear Family began its journey into year-by-year anthologies with its groundbreaking and award-winning BLOWIN’ THE FUSE/SWEET SOUL MUSIC series that tells the story of R&B from 1945-1970. Look for the series to continue into the Funk era. And look for a year-by-year Rock ‘n’ Roll anthology coming soon. # After the volumes covering 1945-1955 were released, the word was out. This series is definitive, fabulously packaged, and faultlessly remastered! Everything you'd expect from Bear Family…and more! # Jack Clement, who produced Johnny Cash, Roy Orbison, Waylon Jennings, Don Williams, and many others, said, "This is the best country series of all time. No doubt. No question." Robert Hilburn in the 'Los Angeles Times'said, "An invaluable album project…enables fans to step back in time and listen to the radio just like Elvis Presley, Ray Charles, and Bob Dylan did." # Now the story continues from 1956 until 1960. Every CD is generously full. Every booklet is extensive and chocked full of rare photos and illustrations, as well as complete stories behind the songs! # In addition to the hits, the series contains rarities that went on to influence country music…and all music…in the years ahead, like Wanda Jackson's original version of Silver Threads And Golden Needles, Carl Belew's original Lonely Street, and Chet Atkins' influential Walk, Don't Run. # This series is designed to introduce new listeners to the very best that country music has to offer… while keeping longtime fans entertained. Every volume is a fabulous time capsule. For many years, we'd received requests to do a truly definitive country series, but it wasn't until the success of our year-by-year R&B/Soul series, 'Blowin' The Fuse' (now 'Sweet Soul Music' and soon to be continued into the Funk era) that we decided we needed to do something comparable for country music. 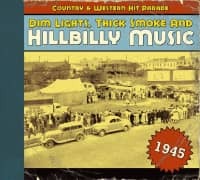 The first volumes of 'Dim Lights, Thick Smoke And Hillbilly Music' took us from 1945-1955, and now the story continues into the era of the Nashville Sound. The series has been compiled with today's fans in mind. Sure, the big hits are there, but so are the classic performances that weren't necessarily hits at the time, but became influential in the years ahead. Every volume has incredibly detailed behind-the-scenes stories, fabulously rare photos, and an ongoing history of country music set against the backdrop of the broader American music business. The booklets alone are 72 pages! Definitive? You bet! Superlatives are often overused, but we feel that this series is part of our mission to bring this incredible music to new fans ... as well as entertaining older fans. We pick up the story in 1956....just as country music was coming to terms with the upset of rock 'n' roll! And, keeping in the spirit of the releases, some of the artists' listings are as they originally appeared - like Jim Edward and Maxine Brown and Bonnie, Wayne Raney - Raney Family (Wayne, Wanda and Zyndall) and Marty Robbins with Ray Conniff - while the cd in each set is stored in a reproduction of a 45 rpm record label bag appropriate to that year. Country music author and historian Colin Escott is responsible for these remarkable releases, an obvious labour of love that has taken considerable research effort, offering a valuable insight into the development of country music over the years. Many of country music's foremost entertainers are included alongside others who may have only earned a place in the footnotes of country music history, but all present a variety of voices and differing musical styles that have virtually disappeared, over half a century later, in contemporary country music's conveyor belt output. The songs were also different back then: sometimes relating to current events, they also regularly centred upon themes like boozin', honky-tonking and slippin' around, now generally considered non-pc in these over sensitive times. 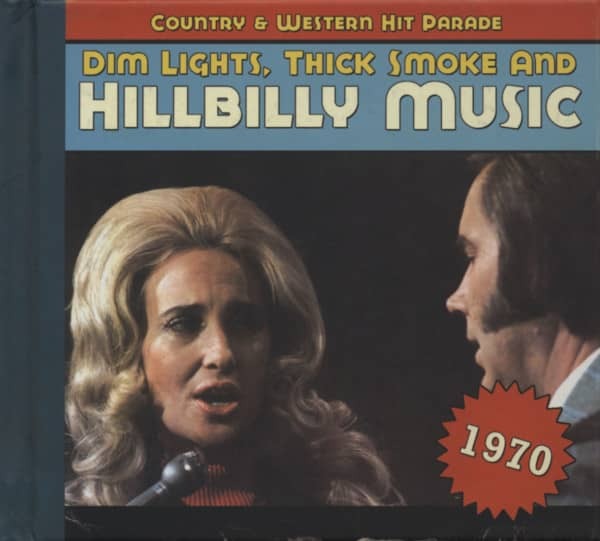 Customer evaluation for "1970 - Dim Lights, Thick Smoke And Hillbilly Music"
These CDs are both essential and things of beauty. Everybody should own them. All of them. Ohne Übertreibung darf man feststellen: Besser geht’s nicht! Dringende Kaufempfehlung für die gesamte Reihe! Nur Richard Weize und sein Team trauen sich an eine so monumentale Aufgabe heran. Egal ob konservativ oder innovativ: Es ist viel fabelhafte Musik auf diesen CDs. Ein passendes Schlusswort einer tollen Serie! An essential collection and well worth investing in the whole series to see and hear how country music progressed from 1945 throught to 1970. I'm starting at the end and working my way back in time. Bear Family have done an absolutely beautiful job with this series - as you would expect from the experts.